Quite a few organisations seems to find this thing called “Internet” a scary thing that employees can only be given access to by grace of the mighty network administrators. As a consultant I have worked for a few of those organisations and felt the frustration when a blog is blocked or network traffic is so slow that you’d guess that it’s manually monitored before accepted. I would personally never try to bypass these controls of course, but hypothetically one could do like the following. You would need a proxy of your own somewhere on the internet that you can access from the corporate network to act as a relay to the free unrestricted internet. It could be a virtual machine running in a cloud service, or a computer you have at home. For this post I’m going to assume a Mac Mini at home running Tinyproxy. For installing applications apart from those in App Store I prefer Homebrew. I leave the config file for tinyproxy pretty much untouched, running at port 8888. I connect to it locally to verify that it’s running, telnet 127.0.0.1 8888. The corporate machine provided to me is a Windows 7 machine in this case, where I start by installing Tunnelier (which also exists in a portable version, if you’re not a local admin). I start by setting up the tunnel to my Mac Mini at home by connecting to its dynamic DNS name on the port I forwarded in my router. 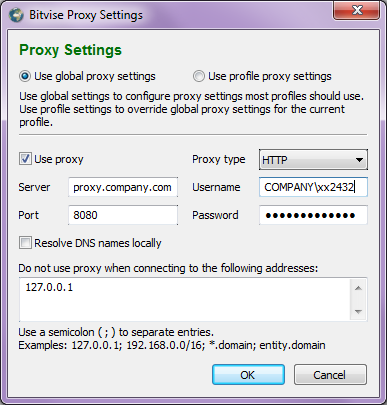 To access Tinyproxy I need to set up some local port forwarding under the client-to-server tab. The destination port should be the one where tinyproxy is listening locally on my Mac Mini, in this case 8888. I also have a VNC server on port 5900 in this screenshot so I can connect graphically to my Mini. The local ports on the Windows 7 machine can be any that is not used already by another service, I chose 1053. 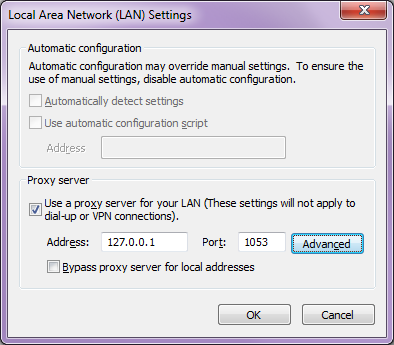 In Internet Explorer (which is really Windows global proxy settings) I enter 127.0.0.1 on port 1053 as my new proxy. Since I must be able to access internal corporate network resources I cannot route all traffic through my home server, so I add exceptions for the corporate domain and IP address range (123.4. * in this screenshot). 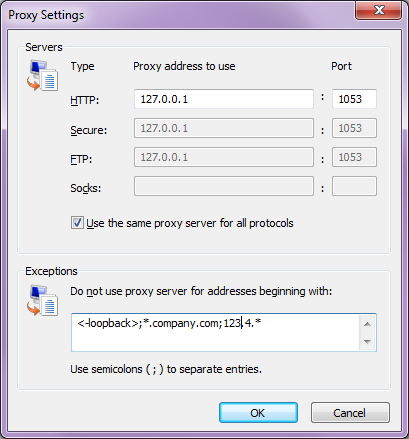 One last thing I could do to make things quicker is to create scripts for turning the proxy settings on and off. If you need to connect to a WiFi in a hotel or on a train where the network is open but requires you to visit a web page to enter some login information, the proxy must be turned off to access that web page. I put these scripts on the desktop so I can right-click them and choose “Run with PowerShell”. A final word of warning is that this will of course be against the corporate IT policy, that’s why I would never do this in real life.